The elections for the European Parliament are a mammoth undertaking spanning four days and involving 400 million Europeans across 28 European Union member states. The Netherlands and the United Kingdom kicked off the 2014 European Elections on Thursday although most of the countries are scheduled for Sunday. European guidelines prohibit the publication of officials results before all voting stations across the EU have closed Sunday evening to minimize the influence of the earlier elections on later ones. Of course plenty of pre-election polling exists in the U.K. and in the Netherlands and these tend to provide an accurate account of what can be expected come election day. More importantly, exit polls are allowed (and routinely conducted) in the Netherlands, even after European elections. If a rippling effect were to exist – admittedly a big ‘if’ – then surely an exit poll could just as well serve that purpose. In fact, wouldn’t it be more troubling for polls to exert this supposed influence rather than actual results? Polling agency Ipsos has been conducting exit polls for public broadcaster NOS for a long time and has a strong track record in that regard. However, due to a loophole in Dutch electoral law, two other players – pollster Maurice de Hond and popular yet highly controversial “shock blog” GeenStijl – have used actual election results to form their own prognoses. While the publication of official results is prohibited, Dutch voters have the right to request election officials to read the results out loud in their presence in every polling station across the country. We can draw some preliminary conclusions based on these prognoses. First, the rightwing populist Freedom Party (PVV) has lost considerably: from five seats (17 percent) in 2009 to about three seats (13 percent) in 2014. This constitutes the third consecutive electoral loss for the PVV – after the 2012 national elections and 2014 municipal elections – which seems at odds with reports in foreign media outlets about the party’s continued rise. To be sure, the PVV remains popular in national polls and its anti-immigrant and anti-EU message continues to resonate with a considerable segment of the Dutch electorate, but its electoral fortunes have normalized. Second, the election turns out to be yet another historic defeat for the governing Labour Party (PvdA). 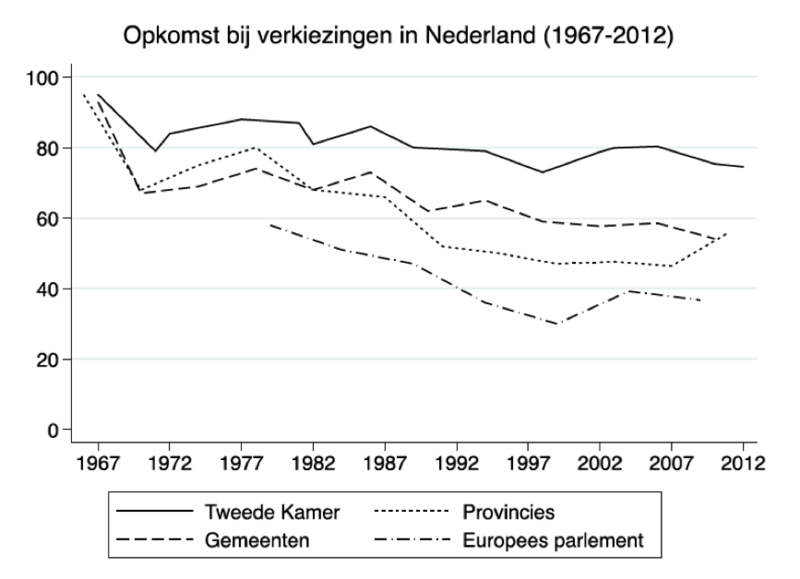 During the first few European elections in the 1980s the PvdA could count on more than 30 percent of the vote but has dropped about 10 percentage points each decade to the current low of 10 percent. The costs of governing were unusually steep for the social democrats due to the timing of the European elections in the national electoral cycle and persistent, high levels of unemployment. Third, perhaps the only unabashedly pro-European party in the country, D66, emerged as one of the main victors. Party leader Alexander Pechtold was quick to proclaim the election outcome as a vote in favor of European integration, as was Guy Verhofdstadt, the liberal candidate for the presidency of the European Commission, but that would be misguided. I suggest another takeaway message: the persistently low turnout. According to Ipsos’s exit poll only 37 percent of the Dutch electorate turned out to vote,about twice as low as in national elections. If there is a silver lining to be found, it’s that turnout in European election has hovered around that same figure for the past 20 years. Perhaps we have bottomed out. Still, as the powers of the European Parliament continue to grow and have expanded vastly over the past few decades, that message fails to reach large segments of the population. It’s sadly ironic that at a point in time when the European Parliament can use every ounce of legitimacy as it might face-off with the European Council over the presidency of the European Commission, Dutch voters can’t be bothered to lend a helping hand to the sole directly elected body in the European Union. Perhaps more worryingly, low turnout distorts election outcomes. It has been showntime and time again that voters do not constitute a random subsample of the electorate at large. One week before the election polling agency TNS Nipo found that Dutch pro-European voters were twice as likely to show willingness to turn out compared to eurosceptic voters. Given that education constitute a key predictor of turnout in many other European countries and that the higher educated tend to be more pro-European than the lower educated, low turnout hurts the eurosceptic cause across the continent. We should therefore be hesitant to interpret the election outcome as a sign that the Netherlands has turned a corner in the direction of further European integration. Armen Hakhverdian is assistant professor in political science at the University of Amsterdam. He is co-founder and contributor of the Dutch political science blog Stuk Rood Vlees.